The crisp chill of the air while bundled up in those fuzzy, warm mittens… snow falling gently outside… Those of you who know me, know that I LOVE this time of the year! Don’t get me wrong – I do love the other seasons and being able to enjoy more time outside. However, there is just something about a nice cozy fireplace, a warm blanket, and watching the snow fall outside all while sipping a warm cup of hot chocolate (with marshmallows of course!). While many of our winter activities involve cuddling up inside and “hibernating,” it is important to make sure that both we and our pets stay active to avoid the dreaded winter weight gain. The movement also helps people and pets avoid stiffening of joints and other health issues associated with decreased activity. 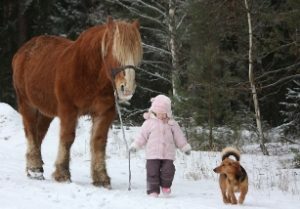 Below are six tips and suggestions to help keep our pets (and us) moving and more active this winter season. The snow outside is beautiful! Head on outside for a walk in the snow and take your pup with you! Walking through the snow can be a good leg workout even with just short distances. Just keep in mind, your pet might get cold. So, put on her puppy jacket and start with shorter distances to keep her active but not too chilled. Dog booties can help keep her feet warm. If you walk on a path or a plowed road, make sure that you wipe and rinse off your dog’s feet after the walk, as road salt can be very irritating to her feet. If outdoor activities don’t sound appealing to you, then check out some indoor doggy parks/play times! At doggy daycare, you can drop your pet off to stay and play with some new pup friends for the day. Other places offer indoor dog parks where you can stay and play with your pup and other friends. Not only does this allow your pup to stay active, but it also allows them to make some new friends and burn off some energy. Whether it’s throwing the ball down the hallway to play fetch or busting out that laser pointer or flashlight for a game of light tag, staying inside can be an easy and warm way to stay active during the winter. But make sure to schedule some time to play, otherwise, that comfy couch might keep you both too sedentary for too long. This is also a great way to help keep your kitty moving and active, too! 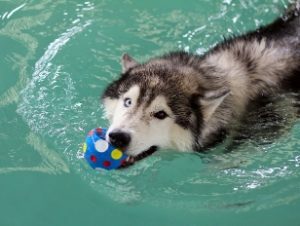 Some areas offer indoor doggy pools to help keep your pup in shape and to help with healing of orthopedic issues. Swimming is a low impact way to exercise while helping to decrease the stress and strain on your pet’s joints. Some of these indoor doggy pools allow their human to join them in the pool, too! Who doesn’t like the sound of that? Eating and staying active sounds too good to be true. Staying active doesn’t just mean keeping your body in shape…it includes your mind, too! Staying mentally sharp and focused can be just as important for your pup’s physical health as movement and exercise. Offer your dog food or special treats using interactive toys or treat puzzles. These toys can help keep his brain stimulated and entertained so that he doesn’t start with negative boredom activities like chewing up the furniture. Who says you can’t teach an old dog new tricks? Take advantage of the colder weather to refresh or brush up on some doggy skills. Whether this is a beginning obedience class or more intense agility or nose work training—classes keeps you and your pet working together and staying active physically and mentally. Classes not only help your pet to continue to learn but it also allows some special time together allowing your bond and understanding to grow. Don’t let the cold temperatures keep you down. With a little creativity, you and your dog can beat those winter blues! Once you make these activities part of your routine, you may find that winter becomes your favorite season. 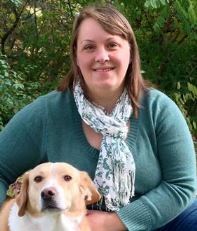 Dr. Heintz is a small and exotic animal veterinarian at Countrycare Animal Complex in Green Bay, WI. She earned her Doctor of Veterinary Medicine from University of Illinois – Urbana/Champaign. Her passion is helping all animals, whether furry, scaly, or feathered, lead long and healthy lives.